Of course I though, here what is? But when I looked closer, I saw a video still of Jimmy Fallon with a book in his hands. It was small so I wasn’t sure what I was looking at, at first. Then, the book came more into focus. OMG! It was my own Fallon’s Jewel! So why the heck was Jimmy Fallon of The Tonight Show holding a copy of my book? Well, the skit he does called DO NOT READ was why! I began to shake. Oh no! Jimmy Fallon is making fun of my book, telling people not to read it! I pressed ‘play’ and watched, nervous. 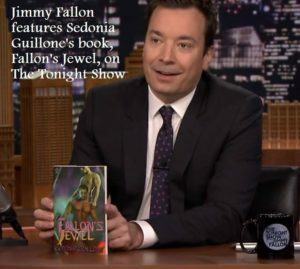 Thankfully, what Jimmy Fallon said about my book was not derogatory and funny so I eventually got over my embarrassment and started to feel grateful that one of the books I’ve written made onto NATIONAL TELEVISION!!! If you haven’t seen the video and want to see what cute thing he said, here it is!